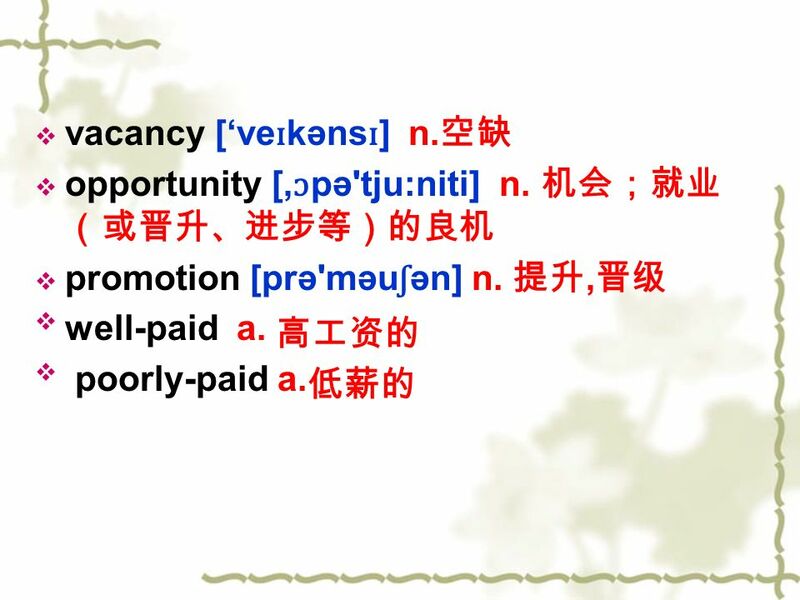 3 vacancy [ve ɪ kəns ɪ ] n. opportunity [, ɔ pə'tju:niti] n. promotion [prə'məu ʃ ən] n., well-paid a. poorly-paid a. 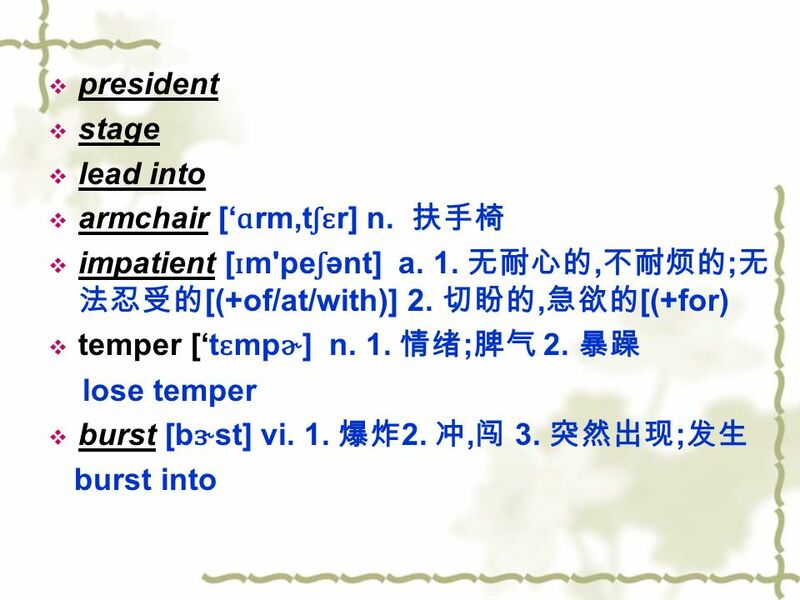 4 Essential expressions a. How much would you like? Can you raise/lower a bit? Lets say 500 dollars. Its our standard/bottom price. How about meeting half way? 5 I dont think I could afford to spend so much money for this. Thats the best we can do. 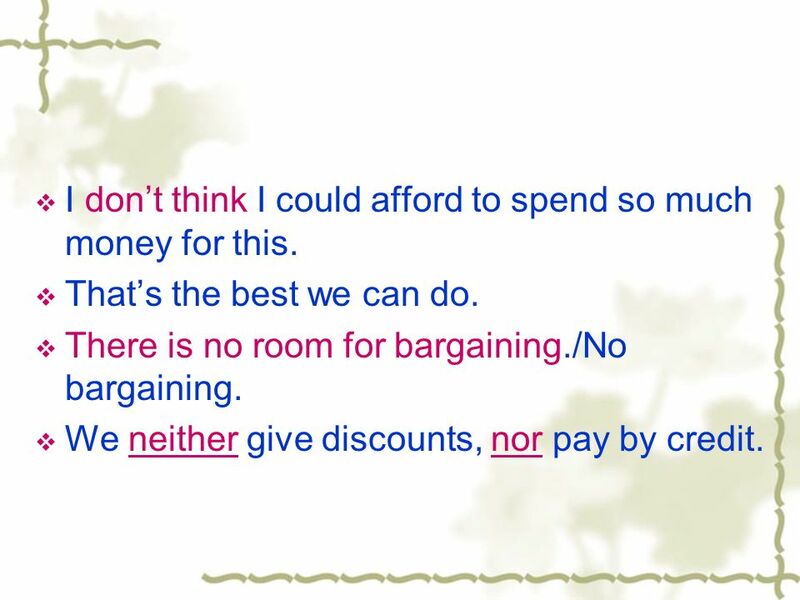 There is no room for bargaining./No bargaining. We neither give discounts, nor pay by credit. 6 b. Im looking for a job of a secretary. Are there any vacancies? Can you manage an interview tomorrow morning at 9 ? 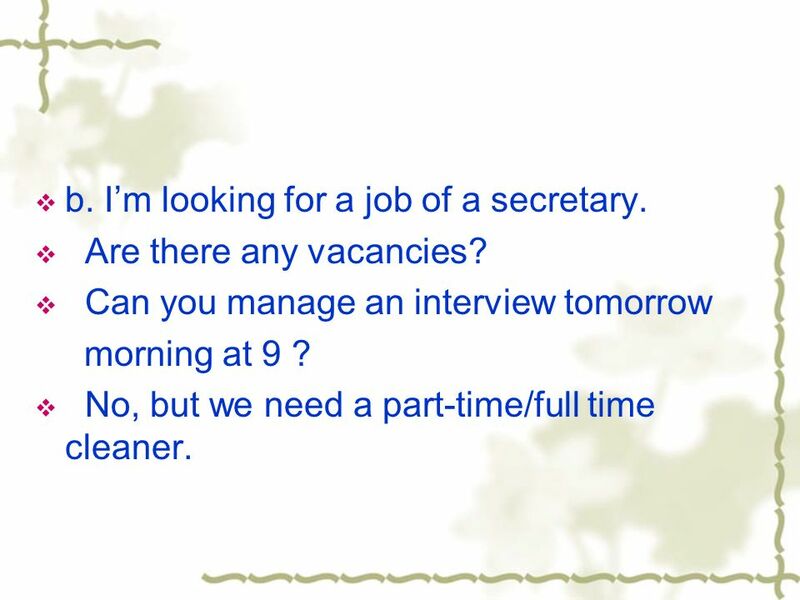 No, but we need a part-time/full time cleaner. 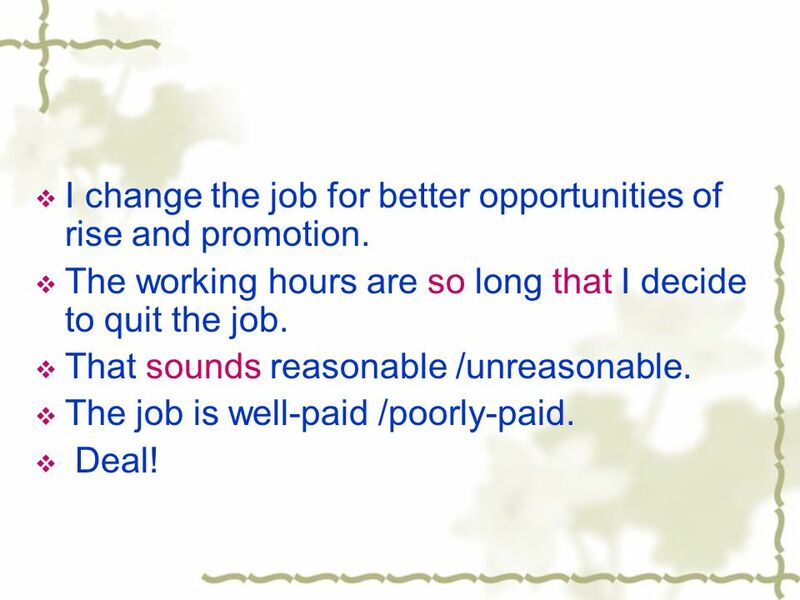 7 I change the job for better opportunities of rise and promotion. The working hours are so long that I decide to quit the job. That sounds reasonable /unreasonable. The job is well-paid /poorly-paid. Deal! 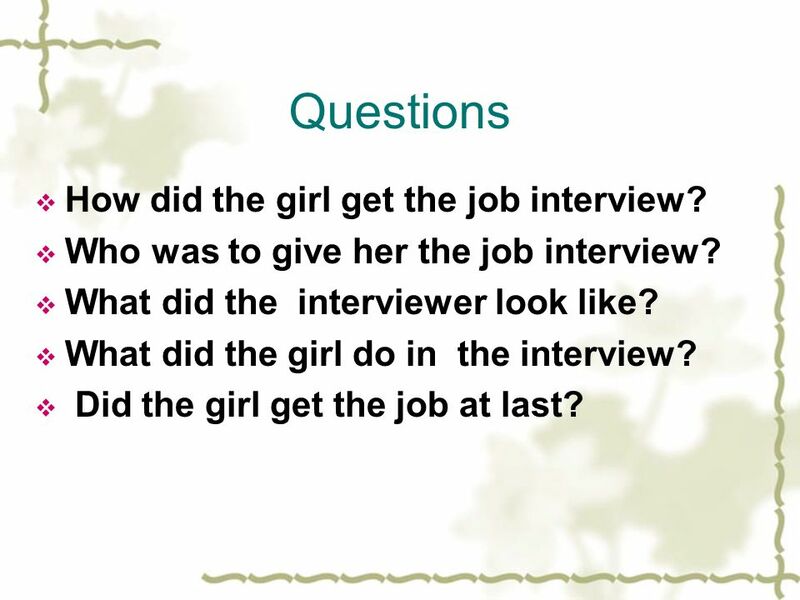 9 Questions How did the girl get the job interview? Who was to give her the job interview? What did the interviewer look like? What did the girl do in the interview? Did the girl get the job at last? 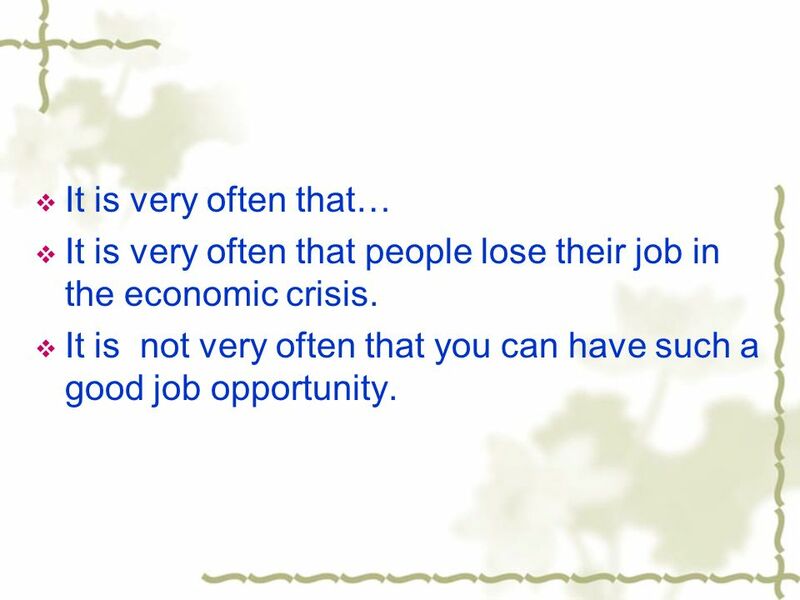 12 It is very often that… It is very often that people lose their job in the economic crisis. It is not very often that you can have such a good job opportunity. 13 1. _______she sees others in trouble,she always them______it. 2. I spent ______ ______ eight hours in finshing the work. 3. 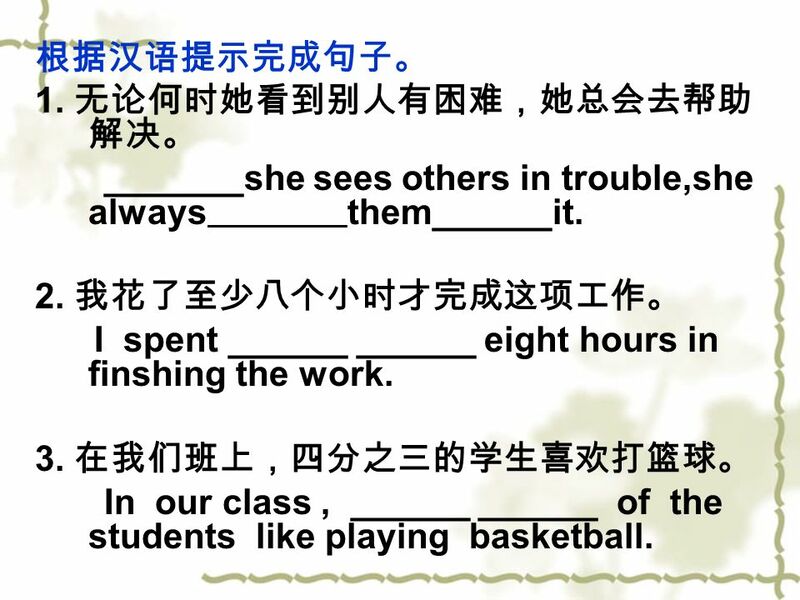 In our class, ______ ______ of the students like playing basketball. 14 4. The ________ is quite low today, isnt it ? Yes, though its ______ now. 5. The _____ is busy at this time. There are a lot of cars on the road. 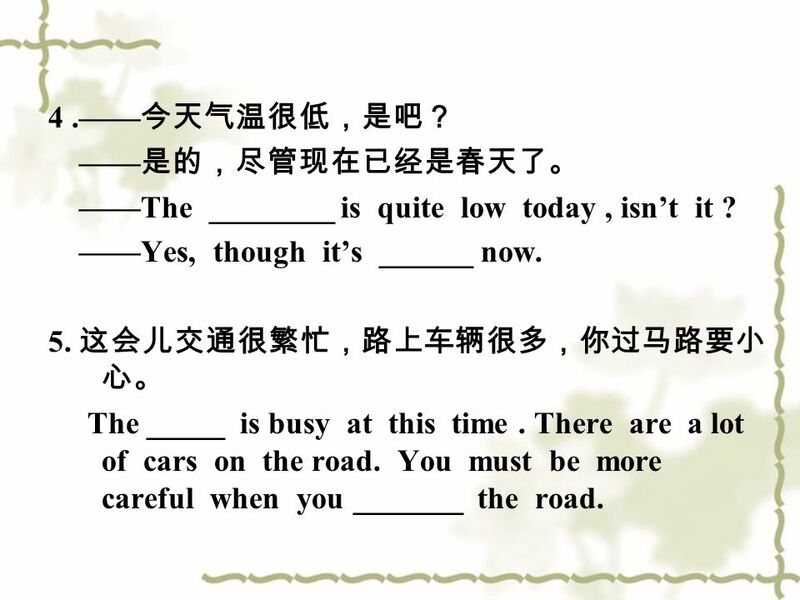 You must be more careful when you _______ the road. 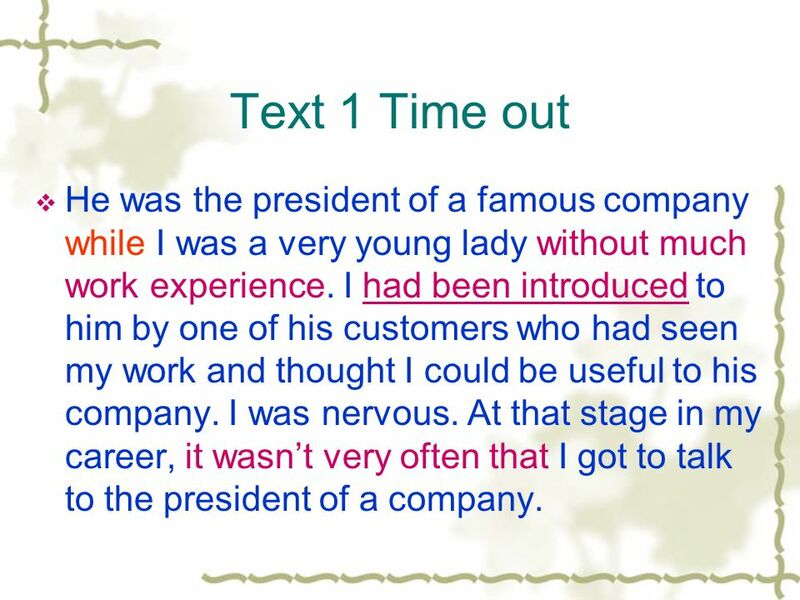 16 Text 1 Time out He was the president of a famous company while I was a very young lady without much work experience. I had been introduced to him by one of his customers who had seen my work and thought I could be useful to his company. I was nervous. At that stage in my career, it wasnt very often that I got to talk to the president of a company. 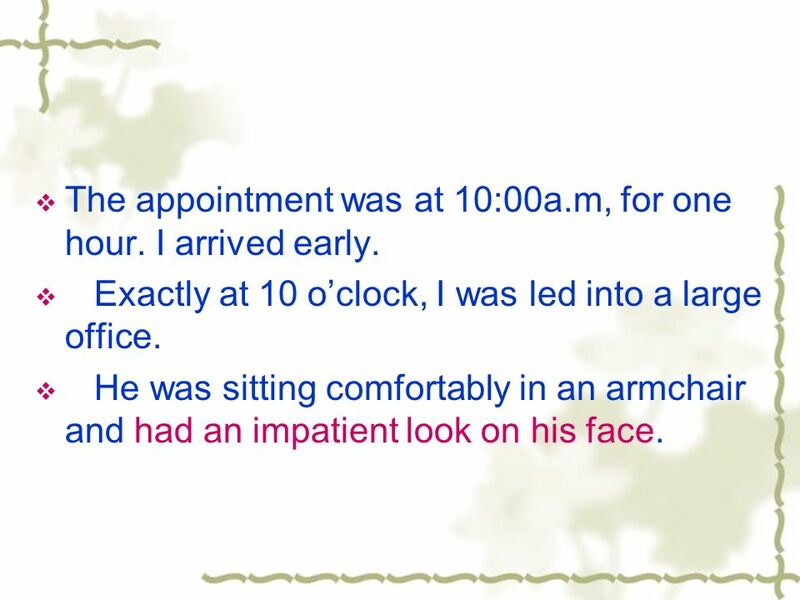 17 The appointment was at 10:00a.m, for one hour. I arrived early. Exactly at 10 oclock, I was led into a large office. He was sitting comfortably in an armchair and had an impatient look on his face. 18 Sit down. 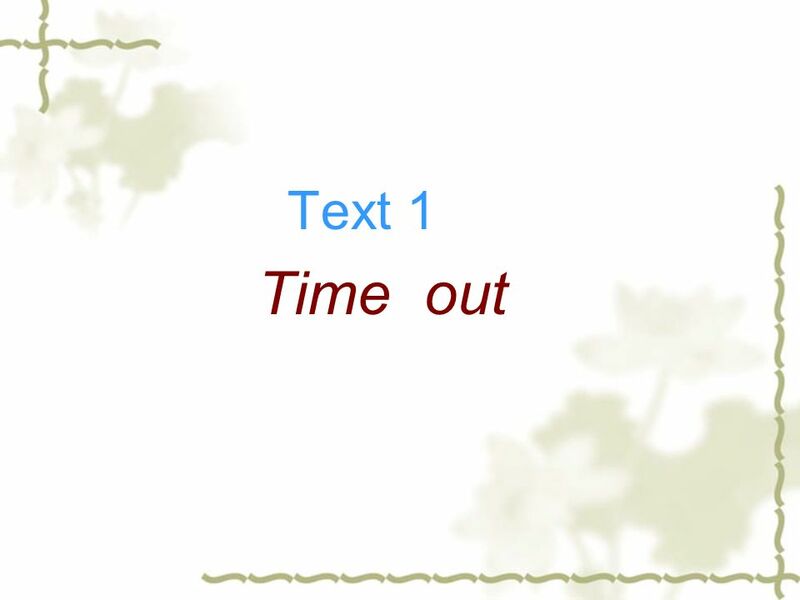 Youve only got 20 minutes. So be quick, he said impatiently. 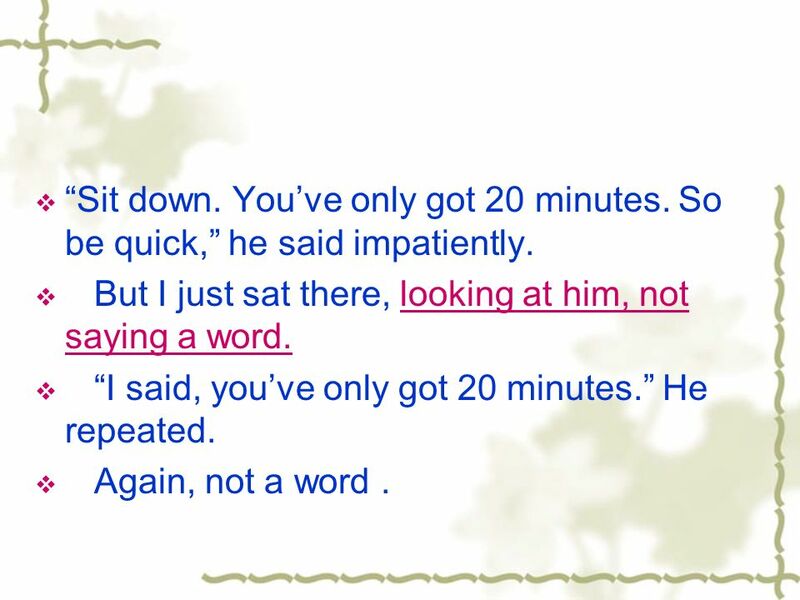 But I just sat there, looking at him, not saying a word. I said, youve only got 20 minutes. He repeated. Again, not a word. 19 Your time is passing. Why arent you saying anything? he almost lost temper. Theyre my 20 minutes, I replied. I can do whatever I want with them. He burst into laughter. We then talked for an hour and a half. 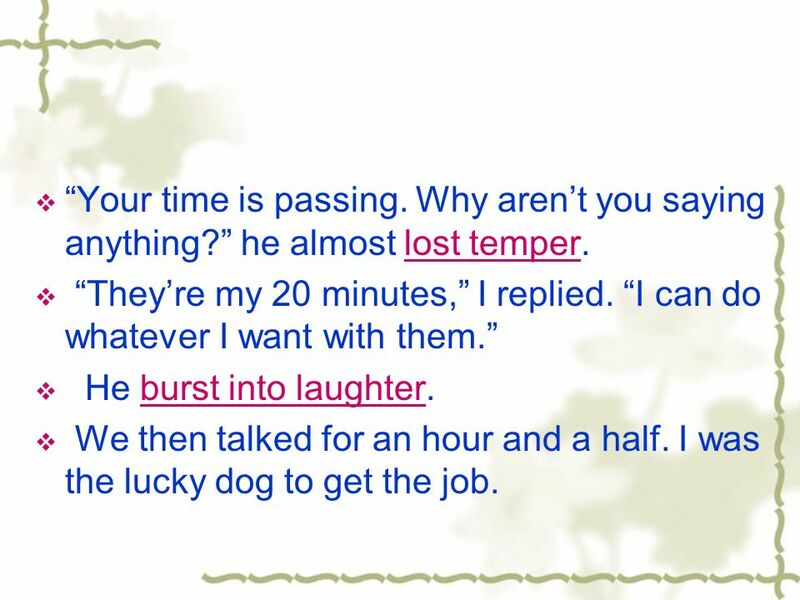 I was the lucky dog to get the job. 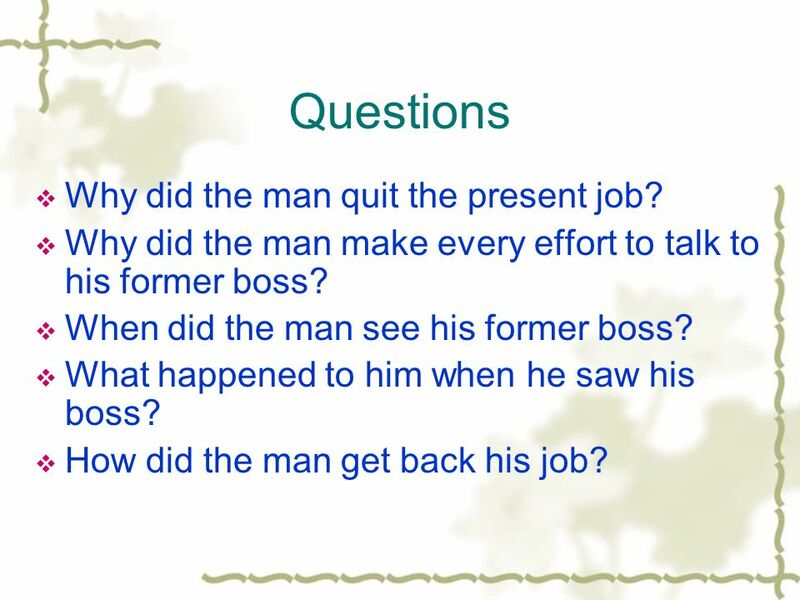 22 Questions Why did the man quit the present job? Why did the man make every effort to talk to his former boss? When did the man see his former boss? What happened to him when he saw his boss? How did the man get back his job? 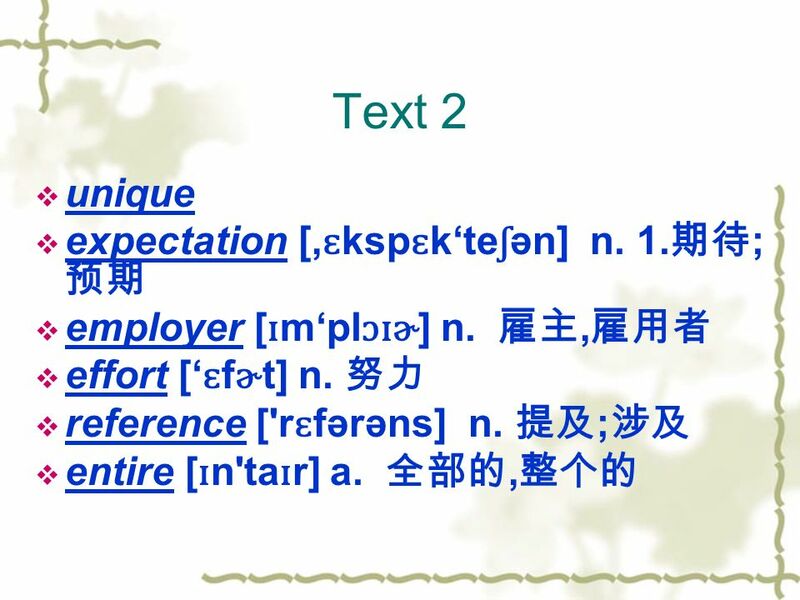 23 Text 2 My unique job interview Id been looking for a job with better opportunities of rise and promotion for several months and after much searching I was finally offered a position. Of course I accepted and looked forward with great expectation to my new career. 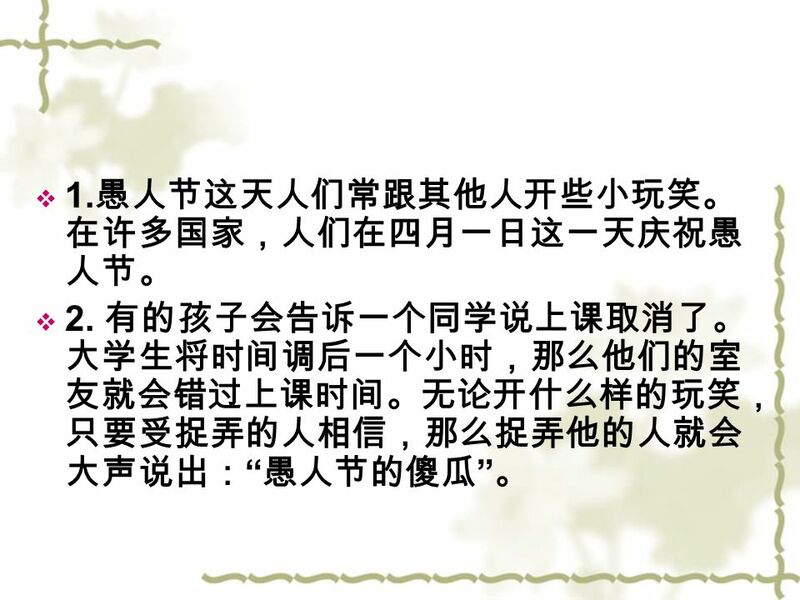 But days after I had given notice to my boss, my now employer called and told me that they couldnt give me the job. 24 Greatly worried, I went looking for my boss to tell her I wouldnt be quitting after all. I made every effort, but she was busy with meetings all day. The following morning, during a staff meeting she made reference to my leave. I had no choice but to tell the truth and ask for my old job back-in front of the entire office staff. She though for a moment and then gave me two months to fine a new job. I was almost crying, but I decided to take my chance. 25 I got all my courage to ask for a job interview for the same position. I was not surprised that she agreed, but I was extremely surprised that I could manage it almost perfectly. I finally got the job again. 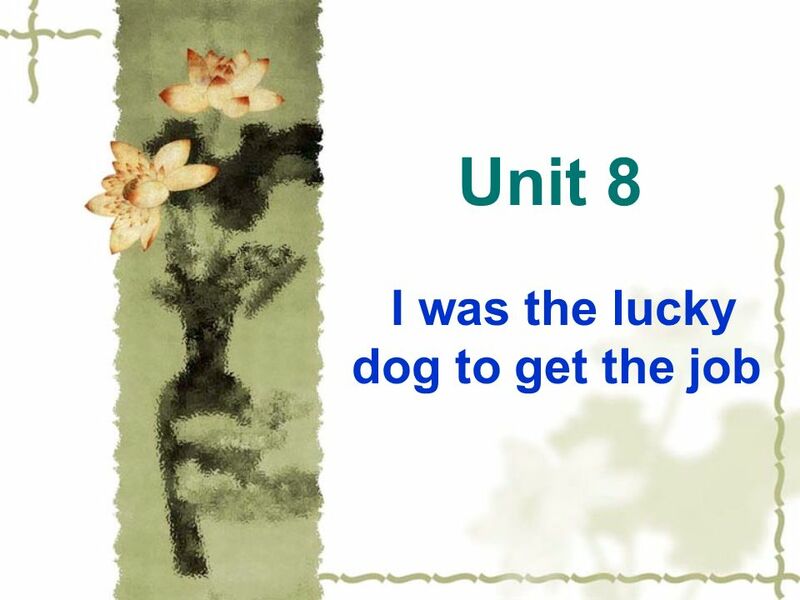 Download ppt "Unit 8 I was the lucky dog to get the job. 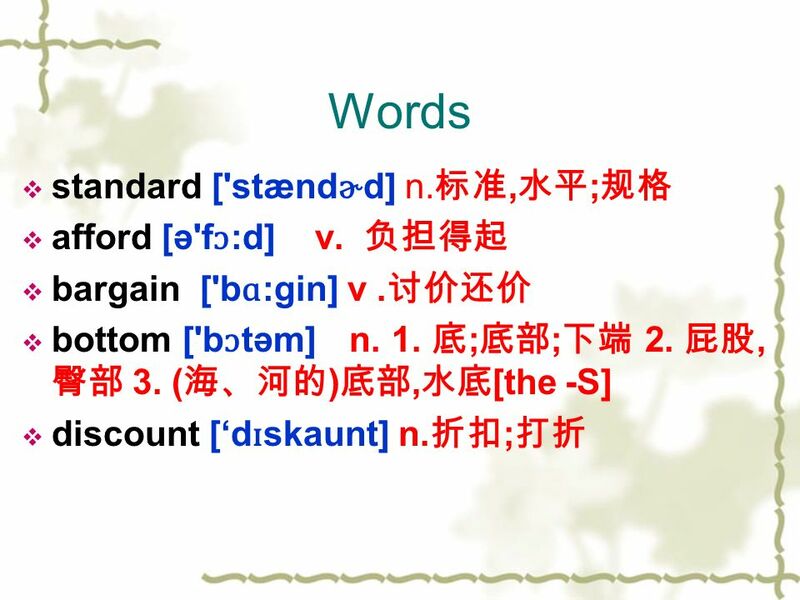 Words standard ['stænd ɚ d] n., ; afford [ə'f ɔ :d] v. bargain ['b ɑ :gin] v. bottom ['b ɔ təm] n. 1. ; ; 2.,"
Unit 2 American Homes and British Homes. 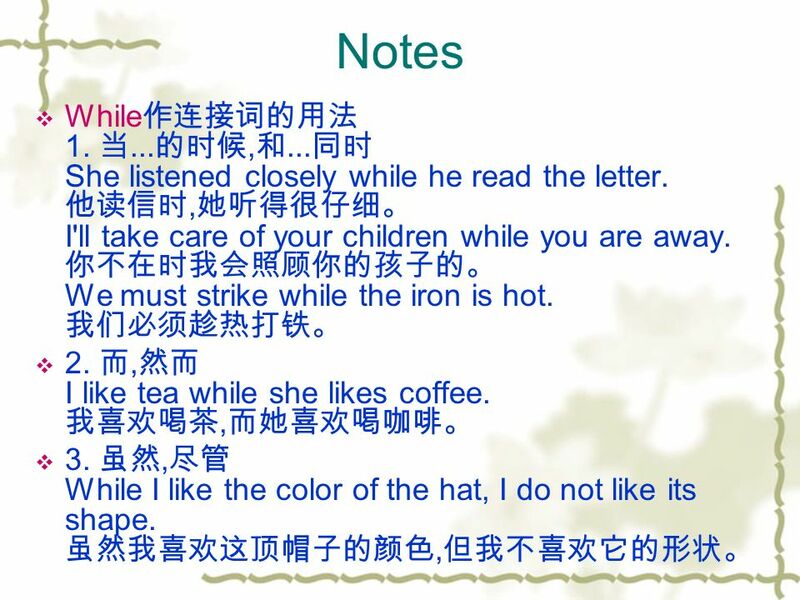 I. Warm-up Activities Discussion Questions: 1. What is your home like? 2. Where do you prefer to live, in a house. It s A Matter of Choice Always …. Jerry is the manager of a restaurant. He is always in a good mood. At the Airport The Warehouse Madrid Upper Intermediate Class. You have two choices. Jerry is the manager of a restaurant. He is always in a good mood. He was driving home one evening, on a country road. Ever since the Levi’s factory closed, work in this small community had been almost as slow as his. 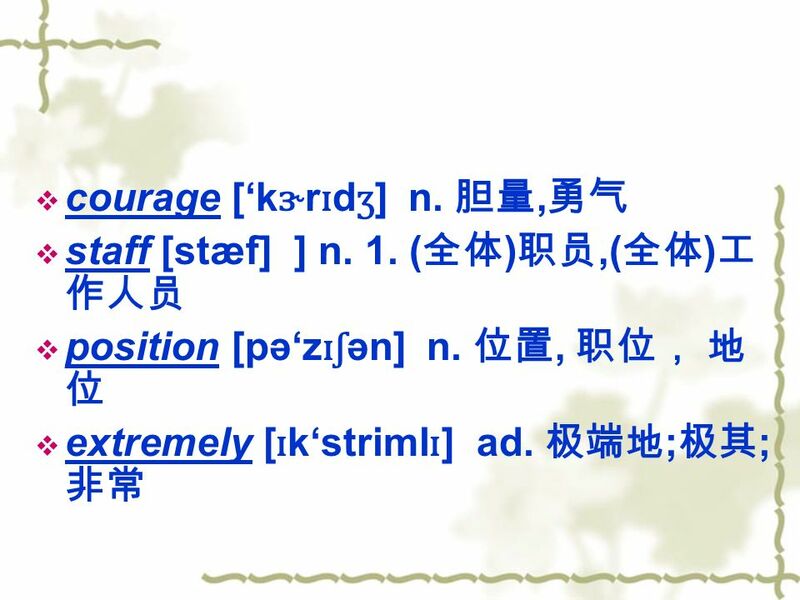 HUMAN RESOURCES VOCABULARY. Hire and fire If you 'hire' someone, you employ them 1. We hired him on a six month contract. 2. I hear that they are not. Making A Request at Work. Most people need to work. Jobs can be enjoyable, but sometimes we can be very unhappy at work. What can we do if we are unhappy. 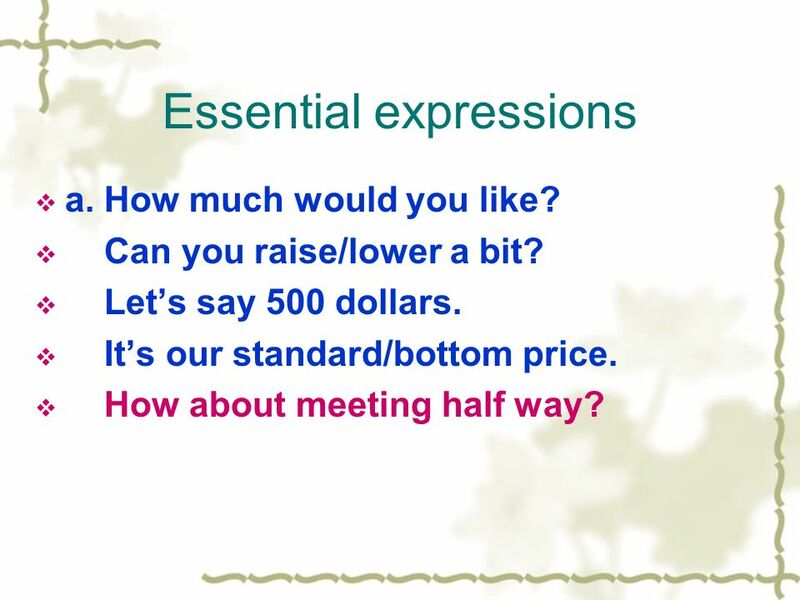 100 TOEIC GRAMMAR QUESTIONS by Jeffrey Hill. 1 Look, it………………..! a) ’s raining b) rains c) has rain d) rain.